Temples, Shrines and other structures of Ancient Kamakura is part of the Tentative list of Japan in order to qualify for inclusion in the World Heritage List. Kamakura is up for discussion at the 2013 WHC, and I wonder if they will make the cut. Especially since Hiraizumi had such a hard time getting in recently, a site that with 'Buddhist Pure Land' eventually found its OUV. Kamakura is a better known site than Hiraizumi, mostly because it is close enough to Tokyo for a day trip (trains take less than an hour) and also for the 'Kamakura period' (1185-1333) when it was the most important city in Japan. The nomination is called "Kamakura, Home of the Samurai". Its originality lies in the creation of the samurai society, that was to rule Japan until the 19th century. The core zone includes shrines, temples, residences, passes and Wakaenoshima port. I visited it for a full day, walking from temple to temple. This isn't nearly as pleasant as in Hiraizumi - Kamakura suffers from a lot of traffic congestion. The sights are scattered around town, some are kilometres away - which could lead to some integrity issues when the core zone of the site is looked at. Most of the time you have to walk by the side of the road, without a real pavement. Signage is also sparsely provided. Fortunately I had picked up a map in English at the tourist information, so I knew where I had to look. Beforehand I had written down the names of the most praised temples, which proved to be a good idea since the map features no less than 61 temples and shrines. Hasedera temple became my favourite. 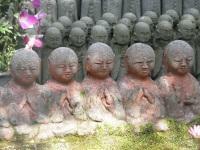 Kamakura has been heavily influenced by China, and Buddhism gained great popularization here. It has some superficial similarities with the (Chinese) WHS of Emeishan and the Leshan Buddha, though that's much older and has a much larger Buddha statue. Kamakura's Great Buddha by the way was the only location that I visited which had a reference to a possible future WH status. I really liked Kamakura. The sites are easy to find and the city puts up signs for those who don�ft understand Japanese. There are many buses for tourists to take and a visitor�fs center right inside the train station in Kamakura. The sites start in Kitakamakura (North Kamakura) and are an easy but a bit long walk down to the Hachiman Shrine in Kamakura. Then it is quickest to take the bus to the far away temples in the east of town and also south in the town of Hase. Hase has the Great Buddha statue and Hasedera with its Horse Headed Kannon Statue. The statues are beautiful and the people friendly. My favorites were the 5 Great Zen Temples. It is also a joy to wander off the beaten path to the smaller temples that are often quieter than their grand neighbors. A great place to visit!